needs, Pace International takes a streamlined approach to selling DISH programming. "We want our dealers to be as successful as possible," Deutsch says. "If there's any question our dealers may have, we partner with them to make sure they have the help and support they need to successfully sell DISH programming, so they can grow their business and profits. Our call center is ready to help answer any customer questions directly. Dealers don't have to worry about knowing the channel lineup options or offering tech support. Our call center can take care of all that." In addition to the customer service center, Pace International provides a variety of support platforms to help dealers better communicate with customers and close the sale. For in- store support, Pace International can provide premium end caps and aisle displays that are designed to draw in the customer. There, dealers can stock the displays with informative brochures and marketing flipbooks. 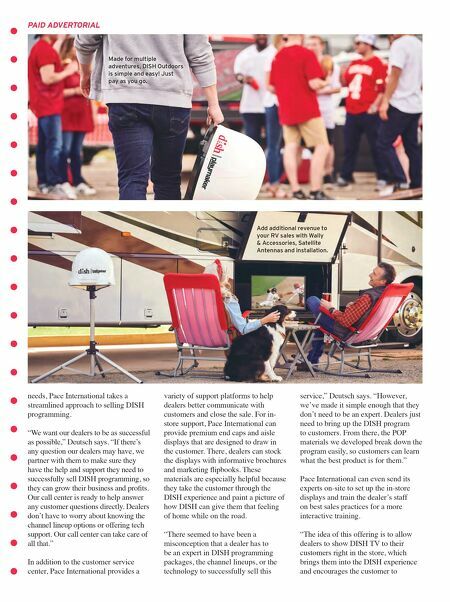 These materials are especially helpful because they take the customer through the DISH experience and paint a picture of how DISH can give them that feeling of home while on the road. "There seemed to have been a misconception that a dealer has to be an expert in DISH programming packages, the channel lineups, or the technology to successfully sell this service," Deutsch says. "However, we've made it simple enough that they don't need to be an expert. Dealers just need to bring up the DISH program to customers. From there, the POP materials we developed break down the program easily, so customers can learn what the best product is for them." Pace International can even send its experts on-site to set up the in-store displays and train the dealer's staff on best sales practices for a more interactive training. 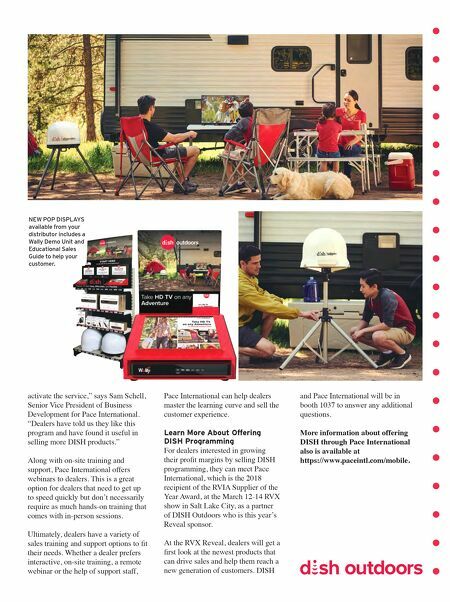 "The idea of this offering is to allow dealers to show DISH TV to their customers right in the store, which brings them into the DISH experience and encourages the customer to PAID ADVERTORIAL Made for multiple adventures, DISH Outdoors is simple and easy! Just pay as you go. Add additional revenue to your RV sales with Wally & Accessories, Satellite Antennas and installation.